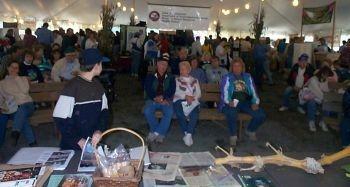 The Durham, CT Fair was held on September 22nd, 23rd, and 24th. A great time was had It was a slow year for the fair, of the 20+ entries sent in, only about half of the those pumpkins actually came on weigh-off night. 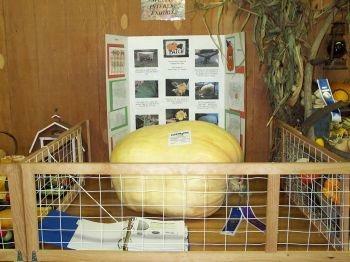 Here is Uncle Sam, the AG grown by the Riverview School Kids. 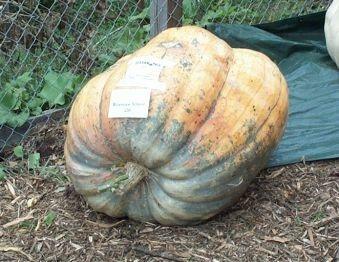 He was self-pollinated on 7/4/00, hence his name. You can see the squirrel damage he took earlier this season. Comming in 11th, this certainly was a fine job done by first year growers. 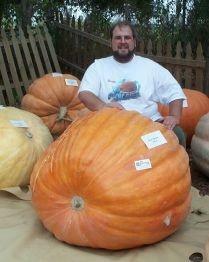 First place went to Curtis Wilson Jr with this fine pumpkin weighing in at 633.5 lbs. 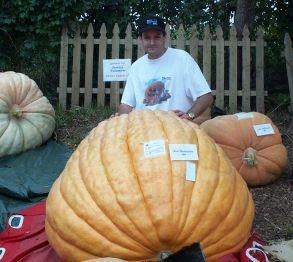 Although it looked smaller then Ken's it had large deep ribs, most likely accounting for its heavy weight. Great job Curtis! This display was put on by the folks at the Riverview School. 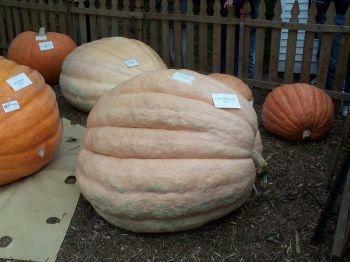 Jodi was a smaller pumpkin that grew on the same plant as Uncle Sam. Her estimated weight was 134 lbs. Behind her is a display board filled with various pictures of the Kid's patch as well as some instructional pictures. The binder below was their grower's log. You wouldn't beleive the detail this book had. Just look at you thick it is... You'll notice that the page it is turned to is a printout of the homepage of this site... Thanks for supporting the site! 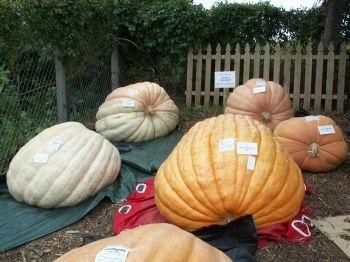 The Durham Fair had asked Alan Reynolds, Ken and I to host a seminar on "Growing Giant Pumpkins". It went really well. We were surprised to see as many people come and listen to our talk with all the other things to do and see at the biggest fair in the state. We showed sections of the main vine of Ken's Maxymillian plant, the crowd couldn't get over how this vine looked like a small tree. This is a shot of the group that was watching the presentation. Notice their trance like state... The crowd was very active in participating in the Q&A that ensued. I lost a bet to Ken, although we were asked the "Milk" question, it wasn't the first one asked. 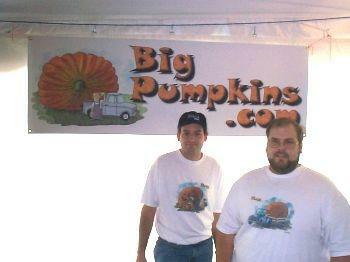 We had a great time, we hope to go back next year.